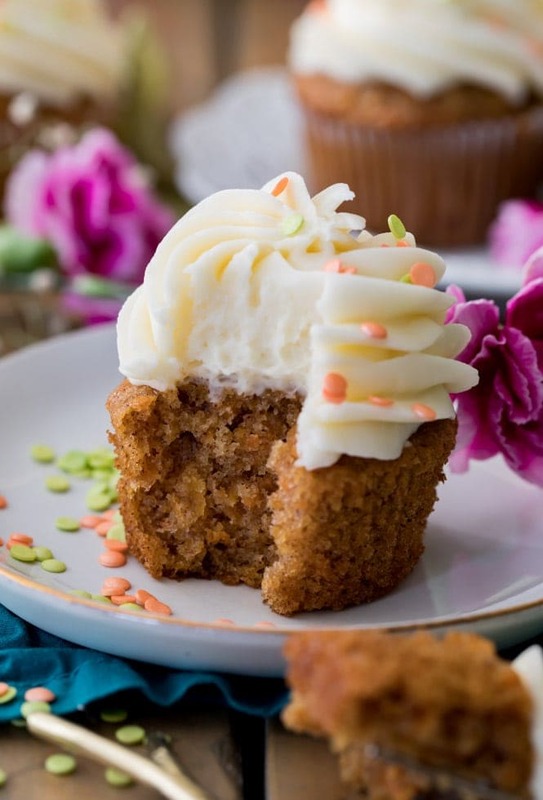 Soft, fluffy, and moist carrot cake cupcakes! 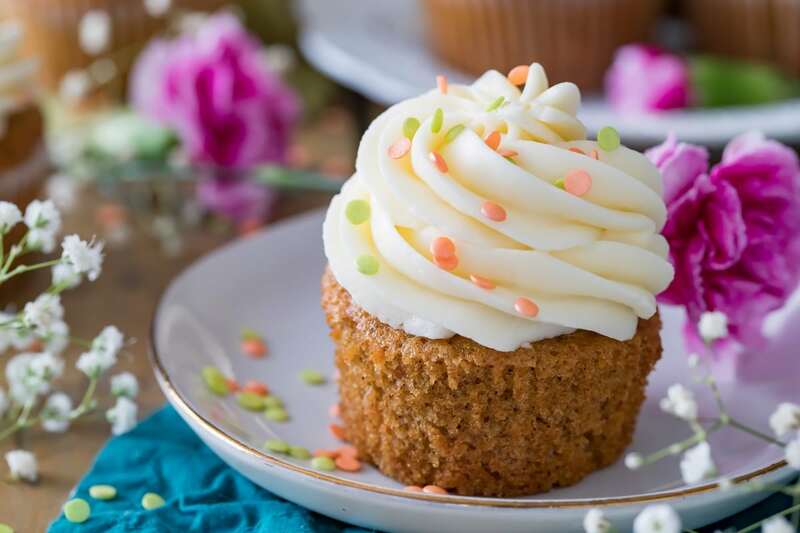 Made completely from scratch with real grated carrots and the option to add nuts or raisins, these cupcakes are always a hit! Make sure to top them off with the absolute best cream cheese frosting. 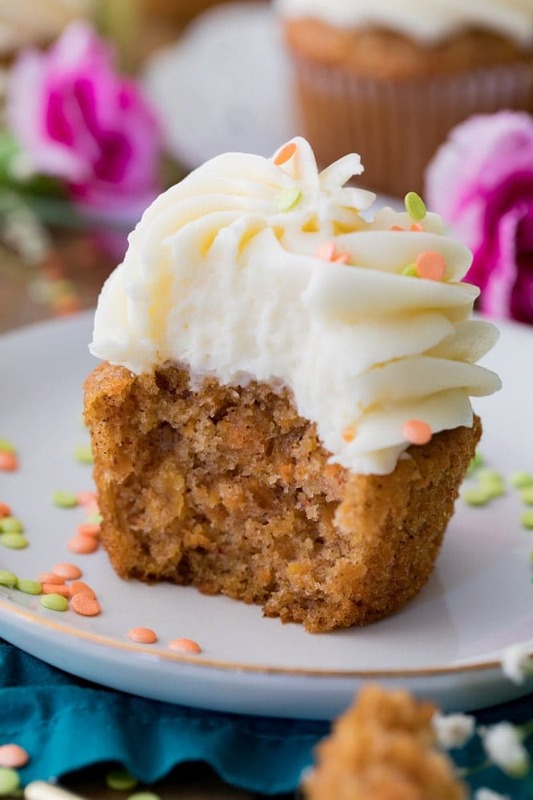 Carrot Cake Cupcakes will forever be my favorite way to get my daily serving of vegetables. Give me a cupcake and a zucchini muffin for each hand and I’ve got the bottom of the food pyramid covered. 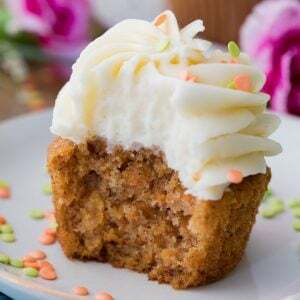 Alright, maybe carrot cake cupcakes aren’t the best way to get your daily vegetables, but it’s definitely the tastiest, especially when topped off with a very generous swirl of cream cheese frosting. They’re soft, moist, and cheerfully fluffy, these cupcakes taste like springtime and sunny weather (which I could really, really use right now!). These carrot cake cupcakes are a modified version of my favorite carrot cake. 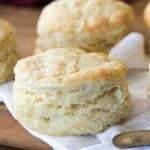 The recipe is almost identical to the cake portion except for a bit more liquid in the batter — the original is perfect for cake but I found it to be too dense in the small space of a cupcake liner and added some milk for a bit of levity. 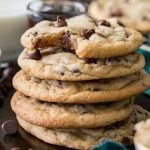 I use all oil in this recipe (no butter) for the moistest (sorry if you hate that word, if you have a better substitute I’m happy to hear it!) cupcakes, and thanks to the spices you’re not missing anything in terms of flavor, I promise! I found that butter just didn’t give these cupcakes the texture that they really needed. 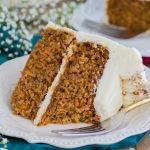 I have a few tips on how to make your own carrot cake cupcakes turn out perfectly, so let’s get into that! I recommend using the grate setting on your food processor to prepare your carrots, and then briefly pulsing them in your food processor for fine shreds of carrot. I feel like just grating them leaves carrot pieces that are too big, but don’t overdo it when you pulse or you’ll have carrot juice and it will impart way too much carrot flavor into your cupcakes! If you don’t have a food processor, you can use a hand grater to grate your carrots. While I didn’t use them for my carrot cake cupcakes, you can add walnuts, pecans, or raisins (why, though!) to this recipe, if you’d like. This batter can hold about 1/2-1 cup of add-ins. This recipe can be doubled to make 24 cupcakes. Enjoy! The full printable recipe is just below the video, make sure to subscribe to my YouTube channel if you enjoy watching these videos!! 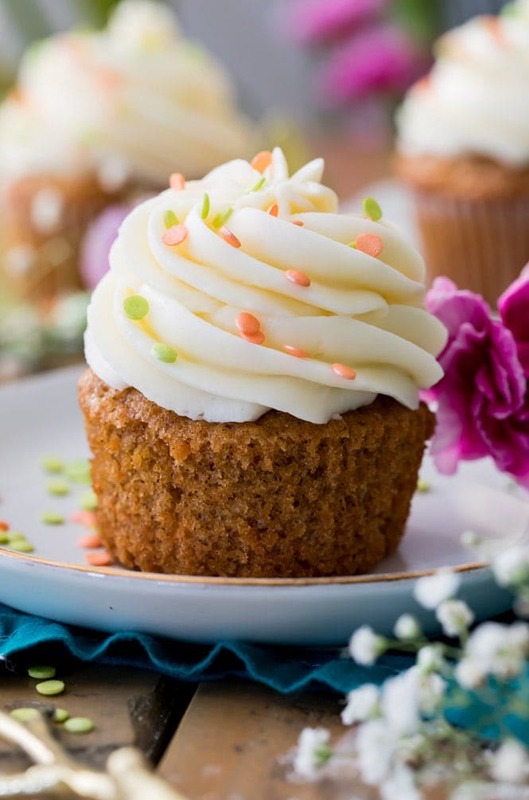 A recipe for moist and fluffy carrot cake cupcakes! Preheat oven to 350F (175C) and line a 12-count muffin pans with paper liners. 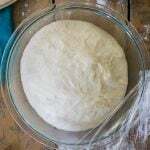 In the bowl of a stand mixer (or in a large bowl using an electric mixer), whisk together flour, sugars, baking powder, baking soda, salt, cinnamon and nutmeg. Stir in canola oil. 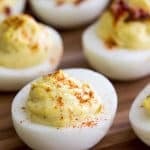 Add eggs, one at a time, pausing to scrape down sides of the bowl after each addition. Beat until well-combined. Add carrots and nuts (if using). and stir until combined. Evenly divide batter into cupcake liners, filling each 2/3-3/4 of the way full. Transfer to oven and bake on 350F (175C) for 20 minutes or until a toothpick inserted in the center comes out clean or with moist crumbs. Allow to cool completely before decorating with cream cheese frosting*. *Cream cheese frosting recipe will decorate 12 cupcakes if you use as much frosting as seen in the photos. If you plan to just spread the frosting on the cupcakes, you can probably get away with cutting the frosting recipe in half. 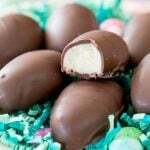 Just made these for Easter with gluten free baking mix (raisins & walnuts) and they are amazing!!! So moist and delicious. So happy to hear this! Thanks for commenting, Jean! 🙂 Happy Easter! 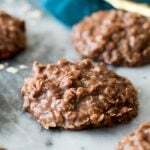 Can I not use nutmeg for this recipe? Or is it a must? Also I can’t wait to make it . I’m so excited! Hi Sujey! You can leave it out. Enjoy! Again, I know this may be a silly question, but I brought a cupcake box holder a day or two ago. After baking them, should I wrap the box in an air-tight seal wrap? 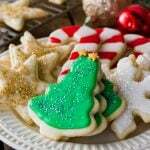 How would you store them overnight before filling and frosting them? Should I use a box with air-tighten wrapped? 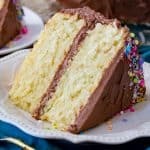 Can you use this recipe for a cake as well? Also, what kind of milk did you use? Should I make them the day before? If it’s possible, could I use vegetable oil instead of canola oil? And could I use 1/2 teaspoon of ground cardamom and perhaps some ginger? 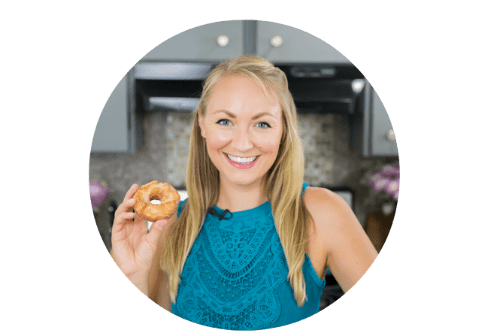 I signed up to your blog not that long ago, and very happy I found it as all your recipes look amazing! I made today the carrot cupcake with nuts-actually left it as a “muffin” for breakfast without the frosting…I will make sure to try and make the frosting as well in the future. I could “almost taste the frosting” 🙂 while eating the muffin today- I can totally imagine how great it will taste together. 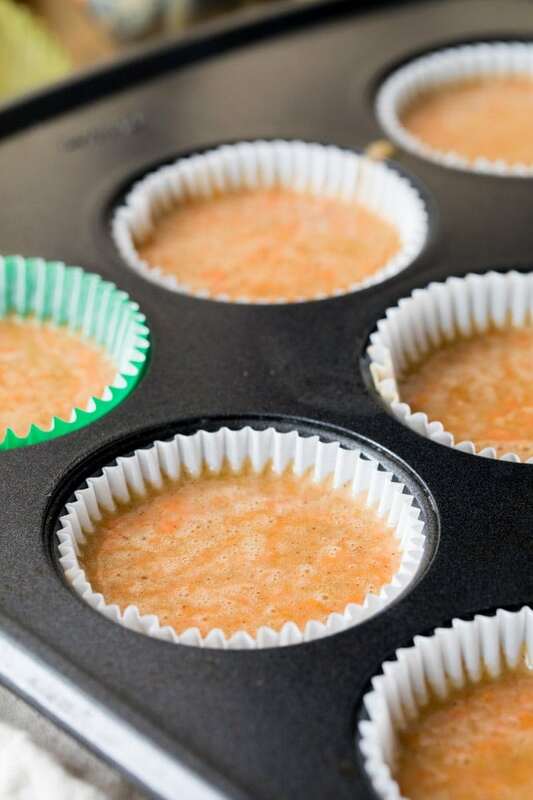 Your recipe is really super easy-the carrot muffins/cupcakes are so fluffy and moist…just melts in your mouth. 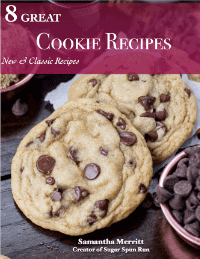 Thank you for sharing such a great recipe, I know I will be making it often :). I look forward in trying your other recipes as well. I absolutely love your recipes and the way you break it all down step-by-step for us. I do enjoy your humor as well. I work with two younger women who are graduating college, and they tell me about needing to learn how to cook. I have referred them to your site and explained that you even provide videos with each recipe. You are awesome.